Powder-Free, General-Purpose Gloves Are Made Of Nitrile To Avoid Potential Allergies. Textured Grip Provides Excellent Wet And Dry Handling Of Objects. Puncture-Resistant, Chemical-Resistant Material Provides Increased Strength For Safe Use With A Variety Of Materials. Beaded Cuff Prevents Rolldown To Provide A Comfortable Fit During Extended Periods. Disposable Design Allows Quick Cleanup After Each Use. Ambidextrous Construction Fits Comfortably On Either Hand For Immediate Use. Nonsterile, Size Extra-Large Gloves Are Perfect For Industries In Healthcare, Dental, Sanitation, Janitorial And More..
Powder-Free, General-Purpose Gloves Are Made Of Nitrile To Avoid Potential Allergies. Textured Grip Provides Excellent Wet And Dry Handling Of Objects. Puncture-Resistant, Chemical-Resistant Material Provides Increased Strength For Safe Use With A Variety Of Materials. Beaded Cuff Prevents Rolldown To Provide A Comfortable Fit During Extended Periods. Disposable Design Allows Quick Cleanup After Each Use. Ambidextrous Construction Fits Comfortably On Either Hand For Immediate Use. 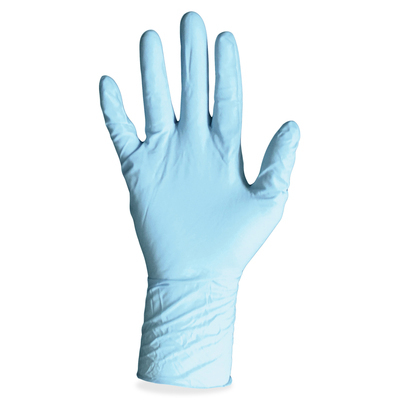 Nonsterile, Size Extra-Large Gloves Are Perfect For Industries In Healthcare, Dental, Sanitation, Janitorial And More.